Maintenance workers have been protecting digging buckets with weld on and bolt on GET and wear bars for as long as any of us can remember. Consequently, the underground loaders must carry extra weight and work harder to overcome the friction created by the wear packages. 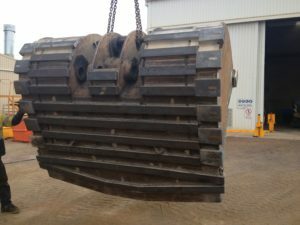 Goldmont Engineering has designed and replaced wear packages in heavy earthmoving equipment for over 30 years. 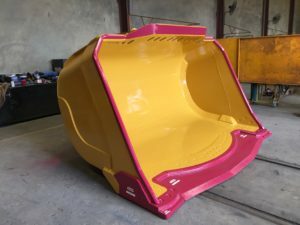 We refurbish complete buckets to OEM and customer specifications. So, our guys know a thing or two about buckets and why they need maintaining, repairing and refurbishing. We have also been listening to what operators want when designing a bucket. No cast heel blocks, lip adaptors, teeth or underfloor wear bars – less weight, less friction. 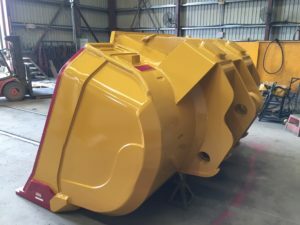 No centre section inside the bucket (single rolled skin, not 3 piece) – less stress on the bucket structure, easier loading and unloading, less hang-up. Single Hardox 500 Tuf skin inside the bucket – high resistance to impact damage and scratching helps material to flow and eliminate hang-up. These photos were taken at the same mine and both buckets had been digging dirt from the same area! 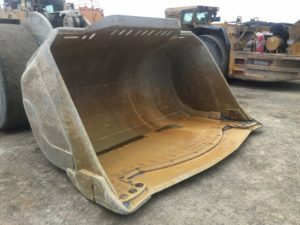 No inner bridge across the top of the bucket – less impact loading while digging. Designed to create a void between the bucket wall and the mine wall – less impact damage and better clean up. Bucket base is higher than lip – less friction when bucket in ground contact. External attachment bores (but centre of gravity closer to the loader) – easier fitting and maintenance. Long life Hardox 550 replaceable bolt on corners. A bucket lip that can be shaped to customer requirements rather than the angle required to suit GET. 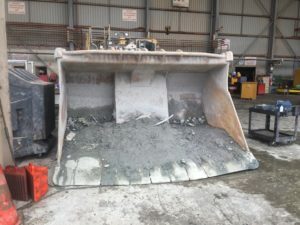 The Bucket is being trialled by Gold Fields at its Granny Smith mine. The trial has been running since mid February and is expected to be finished in early to mid May. The operators are fulsome in their praise of its performance. Even the truck drivers are impressed because less protruding parts on the bucket mean less grabbing on the walls of the truck tray. The Outcast Bucket™ weighs 30% less than the equivalent OEM bucket. 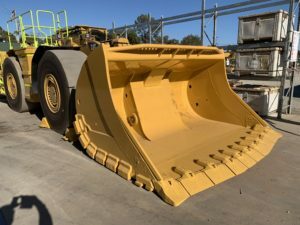 We are still working on translating the reduced weight and maintenance into dollar and CO2 savings but early indications suggest the cost savings will repay the purchase cost of the bucket in two to three years. This takes no account of the value of increased availability and productivity. More information will be released as soon as it is available. How have we done it? Goldmont has combined many years of experience repairing and maintaining underground mining equipment with its design and problem solving skills and access to specialty steels. Goldmont is an expert in using specialty steels to design solutions to reduce the cost of wear and maximize productivity in the mining industry. We are a member of the Hardox Wearparts Network and a partner with SSAB – the global supplier of specialty steels. The Outcast Bucket has been accredited as a Hardox® In My Body product. This certifies the product has passed SSAB’s strict quality control and is approved as a premium product by the SSAB board. The Outcast Bucket is covered by an Australian Registered Design – No. 201817093.